Healthy living requires a healthy body and a healthy body can be considered as the highest of human achievements. Good nutrition improves the health of a country. Some like peas and beans supply proteins and other like potato and tapioca are valuable sources of carbohydrates. Green leafy vegetables are rich in Vitamin A and some crops like tomatoes, potato, and sweet potato also supply ascorbic acid. An area of 200 Sq.m. will be sufficient to meet the demand of vegetables for an average family of 5-6 members. The land chosen for vegetable cultivation should be level and should get adequate sunlight. Before sowing or planting, land should be prepared thoroughly by proper digging or ploughing and made firm to provide better germination and excellent medium for growth. The crop may be sown or beds during rainy season and in pits during summer, at the proper distance. Adding well-decomposed organic matter can do manuring any by use of chemical fertilizers. The organic manures increase the absorptive capacity, improve the physical conditions, absorptive capacity, improve the physical conditions, stimulate biochemical activity, and supply nutrient to the garden soil. Well rotten compost or cattle manure is usually the best form of adding organic matter to the soil. 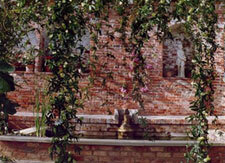 Success in kitchen garden is only possible when there is an abundant supply of irrigation water. Therefore, there must be ample provision for irrigation water. For vegetable crops, regular irrigation at 4-5 days interval are necessary after sowing or transplanting till harvesting. The field should also be copiously irrigated immediately after each application of fertilizers. 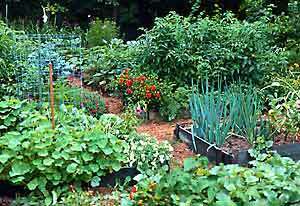 Vegetable crops are prone to the attack of many pests and diseases. But it is better to minimize the use of pesticides against vegetable disease and pests. Stem bores; fruit borers and beetles can be removed with hand. If the pest incidence is severe. But vegetables should be harvested 7 days after pesticide application.